Ever searched around the bottom of your brief case for just that one certain pen or pencil you wanted? Thought so. Or did you give up looking for your Post-It notes, because you thought you must have forgotten them? Yes again. Thanks to Cocoon Innovation, LLC and their Grid-It line of products, those could be long-gone situations. The Grid-It is an amazing piece of engineering, consisting of a flat surface, covered with vertical and horizontal bands of stretchy straps that grab and organize your gear, however you’d like them arranged. 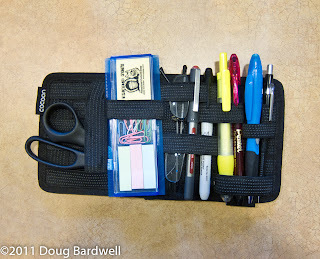 No more three straps for pens, when you have five. No more one slot for MP3 players when you’ve got two, not to mention a pair of ear buds and a recharger cord. Grid-It can handle them all in style. The organization is left up to you. Arrange your gear one way today and then change it tomorrow. 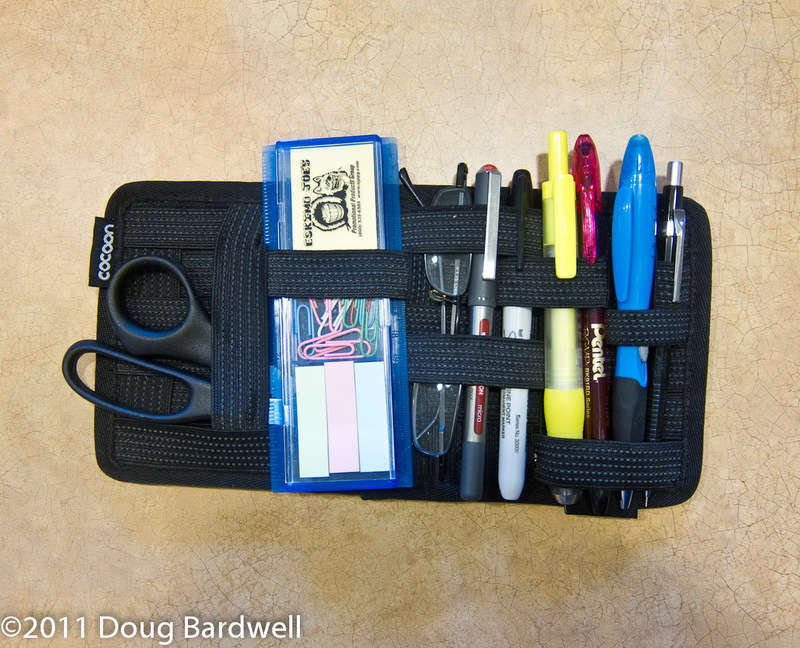 I just set one up with all my office essentials to drop in whatever brief case/messenger bag I happen to grab today. (see photo) The possibilities are endless. The Grid-It is available in various sizes from 5 x 7 up to 11 x 15 with many sizes in-between. There are also combinations available with a Grid-It and a case for your computer, smartphone or gaming device. Check out their website or to get an even better idea of how flexible it is, play their addictively interactive game.